An electron volt (eV) is a measure of amount of energy gained by the charge of a single electron moved across an electric potential difference of one volt. One trillion electron volts is called a teraelectronvolt or simply a TeV. The exact measurement of a Tev in is 1 teraelectron volt = 1.60217646 ×10-7 joules. 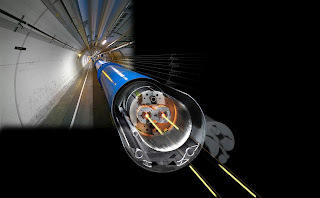 Why is the amount of energy or TeVs important to using the Large Hadron Collider? Basically it boils down to Einstein's Theory of General Relativity, E=MC2. Energy is the product of mass multiplied by the speed of light squared. By colliding particles running at the speed of light in the LHC and measuring the energy released, the LHC can detect fluctuations in energy that may signify a particle most particularly the Higgs Boson. By measuring the energy released, one can deduce the mass of the escaping particles. CERN1 today announced that the LHC will run with a beam energy of 4 TeV this year, 0.5 TeV higher than in 2010 and 2011. This decision was taken by CERN management following the annual performance workshop held in Chamonix last week and a report delivered today by the external CERN Machine Advisory Committee (CMAC). It is accompanied by a strategy to optimise LHC running to deliver the maximum possible amount of data in 2012 before the LHC goes into a long shutdown to prepare for higher energy running. The data target for 2012 is 15 inverse femtobarns for ATLAS and CMS, three times higher than in 2011. Bunch spacing in the LHC will remain at 50 nanoseconds.